Meryl Streep is a better actor than anyone who has ever walked the face of the earth. It's a simple, inarguable truth. Olivier? Overblown wind bag. De Niro? Wretched since "Casino." Pacino? "Jack and Jill." Brando? Hmmm, he's good... but he's not quite Streep. Lest anyone needs further proof, along comes Streep's performance in "The Iron Lady," an Oscar-bait biopic about for British Prime Minister Margaret Thatcher. Unspooling 60 years in the life of the UK's first and only female prime minister, "The Iron Lady" chronicles Thatcher's personal sacrifices as she rose through the ranks of British government, and focuses, in part, on her handling of the 1982 crisis in the Falkland Islands. 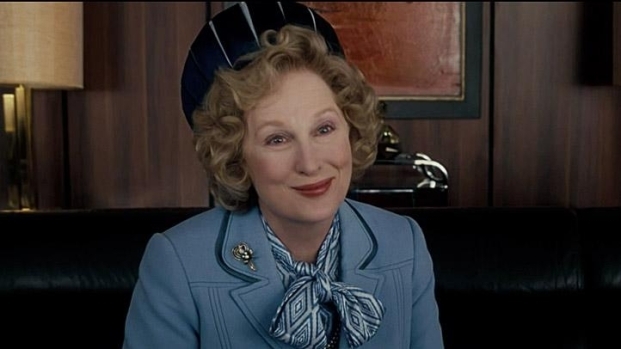 The film reunites Streep with Phyllida Lloyd, the director of "Mamma Mia!" (which features perhaps the worst performance in Streep's illustrious career). Making full use of her shot at redemption, "The Iron Lady" proves that Streep has very few bad days at the office—that odious, fetid trip to the Greek Isles notwithstanding. But Lloyd might want to consider returning her focus to the stage, where she's reputed to have been quite capable. In a medium as graceful as film, however, she flails, lacking the delicacy the genre demands. Equally to blame is the script by Abi Morgan, who did so much with so little when working with Steve McQueen on "Shame," but does too much with too much here. By overreaching for a grand cautionary tale about the plight of women in power, Morgan and Lloyd both miss the mark, coming off as shrill and inexperienced; just what high-octane women should avoid at all costs. Luckily, they have the magic of Streep on their side and that is their catch-all savior. Meryl Streep stars as Margaret Thatcher in this biopic that focuses on the personal sacrifices the British prime minister made to save her country from it's post-WW II funk. Opens Dec. 30. While watching both "J. Edgar" and "My Week with Marilyn," we couldn't escape thinking, "Awww, isn't that cute. Look at Leo/Michelle trying to be this major historical figure." However, we were never transported by a truly immersive performance that went beyond hair, makeup or diction choices. But during "The Iron Lady," we found ourselves constantly startled, realizing, "Oh my god! Wait! That's Meryl Streep, not Margaret Thatcher." It's a consuming transformation by a true chameleon who makes all around her pale painfully by comparison. Streep is divine and impeccable, but her director and the script fail her miserably, rendering "The Iron Lady" a paint-by-numbers biopic that's easily forgotten.